Today’s example of a “Home Seller Don’t” probably doesn’t need an explanation, but just in case it’s not clear on the photo, sellers should check for things like clogged gutters. 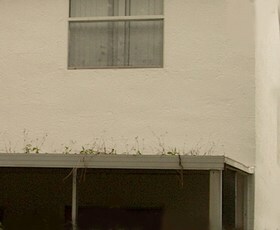 I don’t think weeds are supposed to grow there. Home buyers want to see evidence of a well-maintained house. Since among the first things they’ll notice as they pull up to your house is the landscaping, be sure to inspect it for any necessary improvements. Something that may appear to be as minor as unkempt lawn edging can make a difference to a prospective buyer evaluating your home. 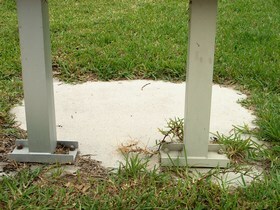 Be sure to use an edger to create and maintain a clean edge between your lawn and pavement. We’ve all heard the expression “you don’t get a second chance to make a first impression” and because of this I strongly recommend that home sellers inspect their property “through a buyer’s eyes” prior to putting their home on the market in order to create a to-do list of items that need attending to. It’s common for people to get so wrapped up in their day-to-day lives that they often overlook or put off things that need to be repaired or replaced. A regular feature on this site is what I’ll call the “Home Seller Do’s and Don’ts” series. Since many of us learn best when things are presented visually, at least one photo will be included with each item in the Home Seller Do’s and Don’ts posts. I think this will prove to be an interesting, if not funny, exercise. 1. Declutter, Clean and Stage Your Home. There is no getting around it, especially in the buyer’s market that most of the country is currently experiencing. A home that has been decluttered, cleaned and staged prior to being placed on the market will almost undoubtedly mean a faster sale and a higher sale price for the seller. Getting a professional home inspection report prior to putting your property up for sale will also alert you to any potential “negatives” the buyer may find. Check out my previous post, titled “How to Get Top Dollar for Your Home” to learn more about the importance of decluttering, cleaning and staging your home. 2. Remember that commissions are negotiable. Regardless of what you may have heard or read somewhere, remember that commissions are negotiable. It is true that you get what you pay for and I will go further into that in tips #3 and #4, but for now, just know that you do not have to offer the same commission rate regardless of which company or agent you hire. The total commission should be based on your needs in combination with what the agent and company can offer you. Before you consider asking an agent to discount their commission, it’s important to know that commissions are split four ways – between the listing company, the listing agent, the selling company and the selling agent. Commissions also don’t necessarily need to be split evenly between the listing company and the selling company (who then pay their agents). It is important that your listing agreement state the commission percentage that will be offered to the selling side (the company the selling agent works for) because some listing agreements I’ve seen do not specify the breakdown, thereby leaving that decision up to the listing agent and their decision may negatively affect the sale of your home. During a buyer’s market it is important that the commission offered to the selling agent be competitive with what other sellers with comparable homes are offering. The offering of a bonus as incentive is nice but just know that in many cases even the bonuses are split between the selling company and the selling agent. If you are trying to decide between offering a competitive commission or a non-competitive commission with a bonus, choose the first. 3. Get in writing what your agent will do for you. All too often, home sellers will sign a listing agreement with a real estate agent without knowing much about what the agent’s services – especially their marketing plan – will include. Your Realtor should be able to at least provide you with a basic outline of what their marketing of your house will include, regardless of your price range or your agreed upon commission. In a buyer’s market, the minimum you should expect is that at least 3-5 photos be uploaded to the MLS within 48 hours of your property being listed. The current South Florida MLS vendor allows up to 16 photos on each listing. The first few days after a property is listed are very important so make sure your agent has plans to make the most of that time. Additional marketing pieces you may want to require include a full-color flyer with property highlights and a virtual tour. The marketing of your home is important because how well it is marketed may have an impact on the number of prospective buyers your home is exposed to. The more (and better) exposure your home gets, the more likely it is that more buyers will see it and possibly submit an offer… which should increase your chances of getting the most money for your house. I often come across listings on the MLS that have been on the market for many months and offer no photos and nothing in the “remarks” field to help me identify why I should show it instead of another similar house. 4. Make sure your listing stands out from the crowd. This is especially true if your area is experiencing a buyer’s market with a glut of inventory of houses for sale. Aside from competitively pricing your home, the next best way to make your listing stand out from the crowd is to market it as best as possible. This means including photos of the exterior (front and back), the yard, any especially nice views that can be seen from anywhere in your house, as well as photos of the key rooms buyers are most interested in (kitchen, bathrooms, living room, family room, etc.). Sometimes it’s also a good idea to highlight the neighborhood, especially if the home is near a park or the neighborhood offers a clubhouse and pool or has an elegant entrance. Additional marketing can include a virtual tour, preferably one that includes at least a dozen photos, including panoramics. When considering marketing, think about the types of materials that you get whenever you’ve visited a new home builder’s community. They almost always include a floorplan of all the models they are offering, as well as a full-color brochure or feature sheet that outlines all the highlights of the home. Ask your agent if they are willing to provide this service. One last note… be sure to make your home as easy to show as possible. In South Florida this typically means putting a lockbox on the door, allowing showings on a moment’s notice and not being present while the house is being shown to prospective purchasers. Agents pay attention to showing instructions, especially when their time is limited. The more obstacles you put in their way, the less likely they are to include your home among those they’ll show when their buyer is only in town for a day… unless, of course, it meets all of their buyer’s criteria. 5. Refuse to pay transaction/administrative fees on top of a commission. This is something that very few real estate agents will tell you because most brokerages that charge such fees require that the agent pay them if the seller (or buyer) refuses to pay them. I’ve seen these fees range in cost from about $95 to $695 per transaction (buyers and sellers are charged separately). The majority of real estate agents will not tell their buyers about this fee until the buyer is ready to sign an offer, at which point the buyer feels obligated to pay the fee. I call them junk fees because these fees did not start appearing on contracts or HUD closing statements until several years back. The fact is that neither the buyer nor the seller have to agree to pay these fees in order to put an offer in or list their home. The fees are strictly just another profit center for the real estate brokerage, regardless of what they tell you they are for. If these fees were in any way “mandatory”, then all brokerages would not only be charging them, but be charging the same amount. 6. Don’t let your emotions rule. Buyers should avoid getting fixated on any one particular house and be sure to display their best poker face while touring any home where the seller is present. Sellers should keep check on their emotions especially during the negotiating process. Just because a buyer places a low offer on your home, does not mean they don’t believe it to be worth more and may actually be willing to pay more. It helps to keep in mind that though it may be a home to you, it is just a house to the buyers until after they move in. Your listing agent should regularly keep you updated of any recent closed sales of comparable homes so that when you receive an offer you feel informed and can respond accordingly. 7. Location, location, location should always be “top of mind”. If you’ve heard it once, you’ve heard it a thousand times! The three most important things to remember in real estate is “location, location, location”. There is good reason for this. The better the location, the more valuable the real estate. Some millionaires have made a great deal of money investing in real estate simply by being good at foretelling where the next “hot spot” will be and buying property in all the right places. Do your research and choose wisely. 8. Education is paramount if you have school-age children. Getting a “bargain” on the purchase of a new home is worthless if that so-called bargain will mean your school-age children will be provided a less-than-ideal education by the local public schools. The Florida Department of Education website is full of links that will help parents make informed choices. Even if you don’t have school-age children, it’s a good idea to be aware of how the local schools rate so that your home will likely be desirable to prospective buyers that do have school-age children. 9. Buyers can request CMAs, too! CMA stands for Comparable Market Analysis. Performing a CMA is how real estate agents are able to establish approximately how much a home is worth. Most buyers do not request that their real estate agent provide them with a CMA before they place an offer. The knowledge gained by reviewing a CMA can be invaluable during the negotiating process. 10. Ask the seller for concessions. However, keep in mind that if the seller does not need to sell quickly, the property is priced fairly, in good condition and/or in a good location, the seller may have no motivation to offer any concessions. It’s important to keep all of these factors in mind before placing an offer. Decluttering your house is important because if buyers see that you don’t have enough room for your own things, they may equate that to mean they won’t have enough room for their own things if they buy your house. Rent a storage space for a couple of months if you have to, the effect it will have on the sale of your home will be well worth the cost and effort. You’re going to have to pack things up to move anyway, so why not start packing the least used items before marketing your house? It will make your garage and closets look more spacious and organized. Have a garage sale if you want to make a little extra money. What’s left over should be thrown out or donated (save on taxes the following year!). Cleaning your house is at least equally as important as decluttering it because buyers may equate a dirty house with one that has also not been well maintained and may need certain things repaired or replaced. In some buyers eyes a clean house is a well-maintained house that is not likely to require additional money out of their pocket any time soon. Try to spend at least 25% more time than you normally would just to keep your house in “showing condition”. Although I don’t typically recommend the following alternative, if you find this task too daunting, at least require a 2+ hour “heads up” before allowing your house to be shown. The more difficult you make it for agents to show your house (especially when inventory of similar homes is high), the less your home is likely to be shown, so avoid putting obstacles in the way of it being shown at a moment’s notice. Staging your house is something that is worth the effort if you want buyers to have a lasting and good impression of your property. Although professional staging services have sprung up in recent years, the main idea to keep in mind is to have your home looking as much as possible like a “builder’s model”. Placement of furniture is important, but so is the general look throughout the home. Fresh flowers and setting the table with your best dishware and flatware (as though you’re expecting company) helps. Above all, avoid having unpleasant odors anywhere in your house, but if you must use a deodorizer please remember to go lightly with it as some people are allergic to strong scents.